A good news for all goverment job seekers in Rajasthan. Bumper vacancy more than 11,000 jobs notification released. Mainly this recruitment is for junior assistant or kanisth sahayak in various departments, offices. 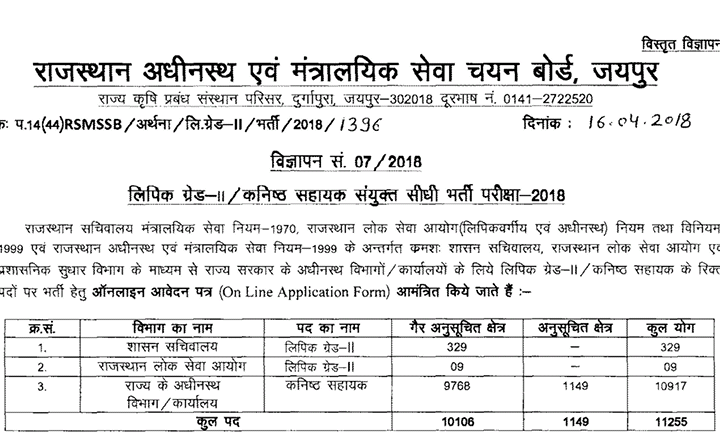 Other detail about RAJASTHAN JUNIOR ASSISTANT RECRUITMENT 2018 given here. In this artical you know about number of vacancy , exam pattern, exam date , Educational Qualification, how to apply etc. 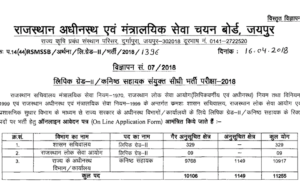 In this recruitment 10917 vacancy for junior assistant and 398 for Clerk Grade 2. Its a 2 phase examination. First is offline objectivetype test. Second is Typing test in Hindi and English. All questions is phase-I test will be objective type. Paper will be conducte offline mode. Level of questions on base secondary class of Rajasthan Board. All these post basic pay is on 7th pay Commission. Pay scale is Level -5. Pay Matrix of Level-5 is 20,800. Aproximatily salary is 30 plus. Check below. Age Limit as on 1st January 2019. Note: SC/ST/OBC candidates should belong Rajasthan. Belong to other states than Rajasthan are considered in general category. 2. O- level certificate by DOEACC OR any computer science diploma or degree OR Rajasthan government any equivalent certificate.